6631 ✉ 20 12 Pfg. 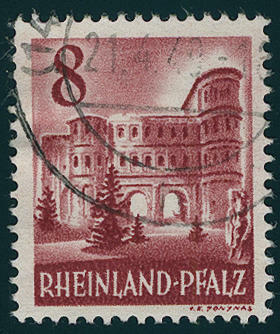 Porta Nigra, horizontal pair on correctly franked interzone letter from \"BAD KREUZNACH 7.8.48. 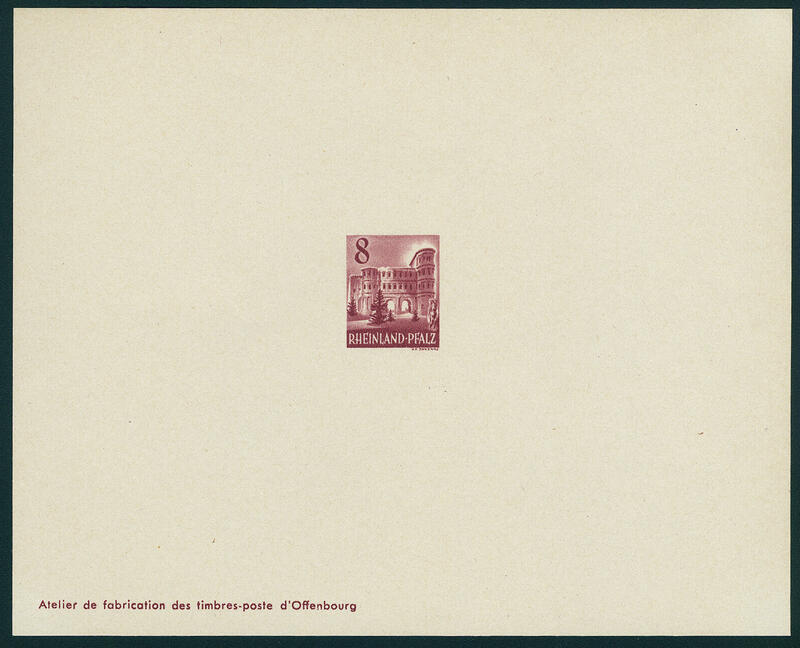 \" to Mannheim-Freudenheim and there forwarded to Basle / Switzerland and postage stamps added with American/British Zone 10 Pfg., 16 Pfg. Net pattern overprint. An extraordinarily interesting and scarce combination! Photo expertize Straub BPP. 6632 ✉ 30 20 Pfg. 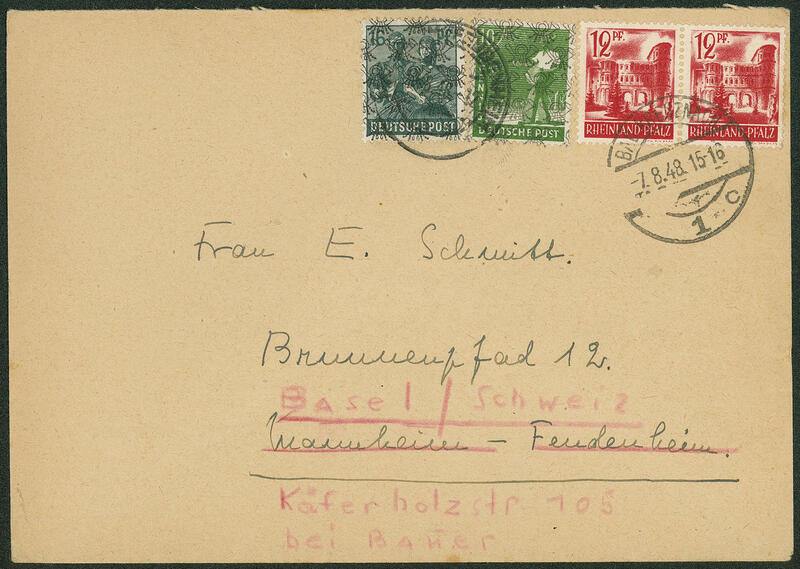 Auxiliary work Ludwigshafen, corner of the sheet with sheet number \"B No 001135\" as correctly franked single franking on cover from \"LUDWIGSHAFEN 20.12.48. \" to Enkenbach. 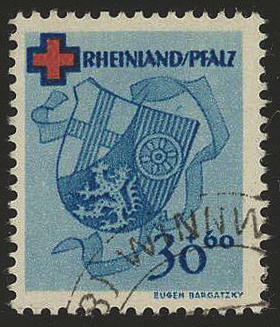 Sheet numbers of this issue are on cover extremely rare! 6633 ✉ 30 20 Pfg. 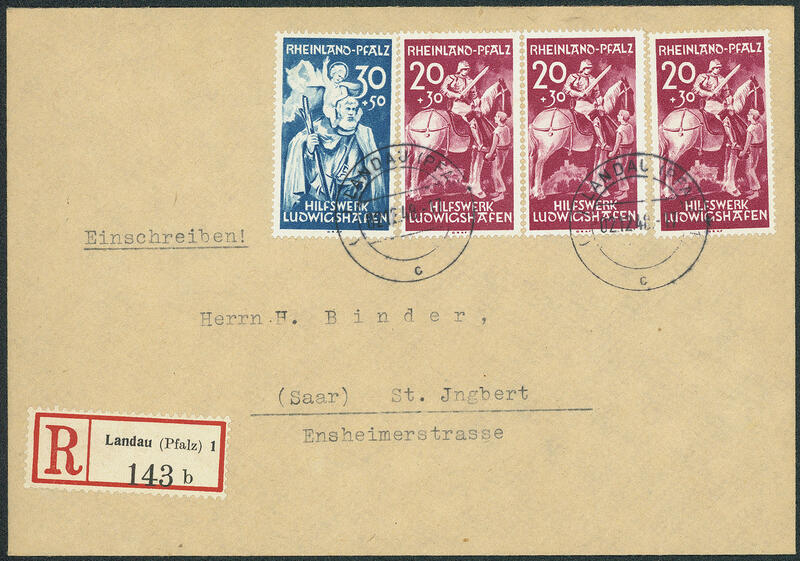 Auxiliary work Ludwigshafen, in perfect condition as correctly franked single franking on cover from \"BAD EMS 25.10.48. \" to Bad Kreuznach, photo expertize Straub BPP. 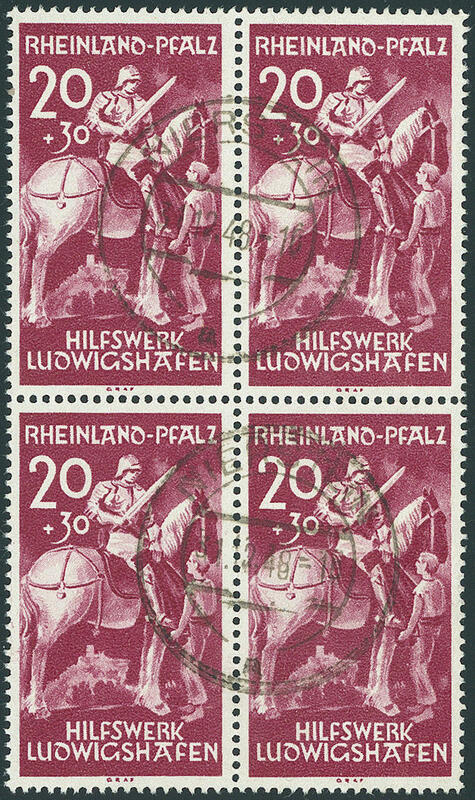 6634 ⊙ 30/31 Auxiliary work Ludwigshafen, block of four set fresh colors and very well perforated, here and there perforation prefolded, a little separated, neat cancelled \"NIERSTEIN 31.12.48. \". 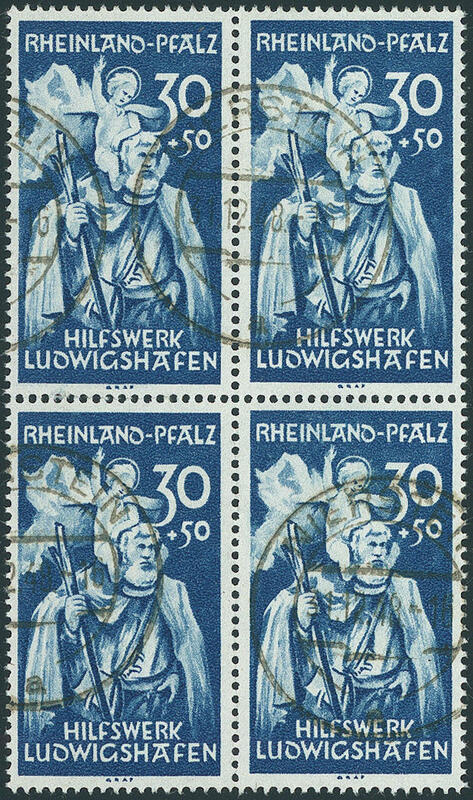 Block of four sets of this issue are used very rare! Photo expertize Straub BPP. 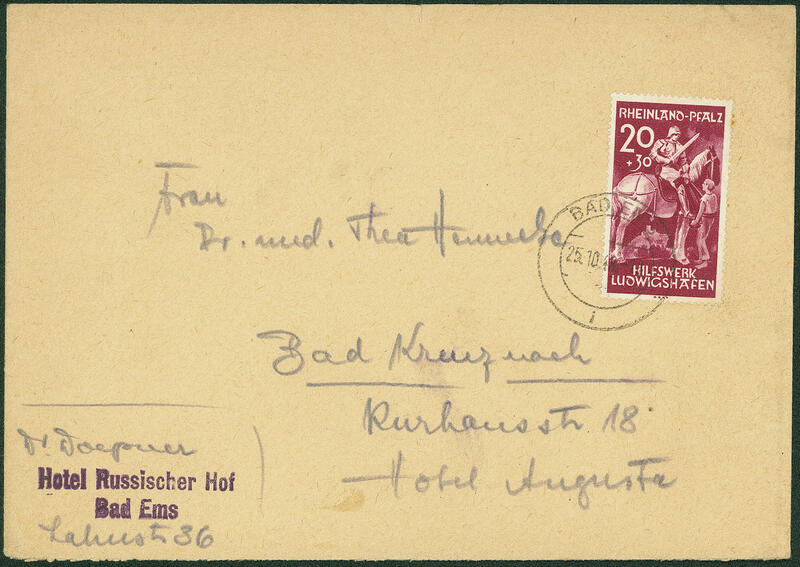 6635 ✉ 30/31 Auxiliary work Ludwigshafen 1948, 20 Pfg. (3) and 30 Pfg. 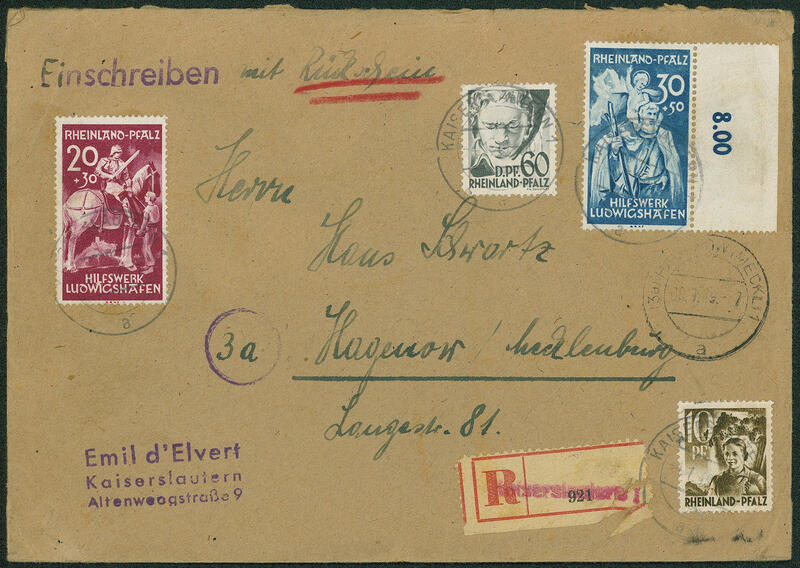 As exceptional scarce franking combination on correctly franked registered cover in the 2. 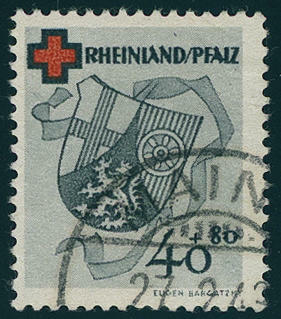 Weight step from \"LANDAU 2.12.48\", a value minimal trace of crease, to ST. INGBERT / Saar with arrival postmark. 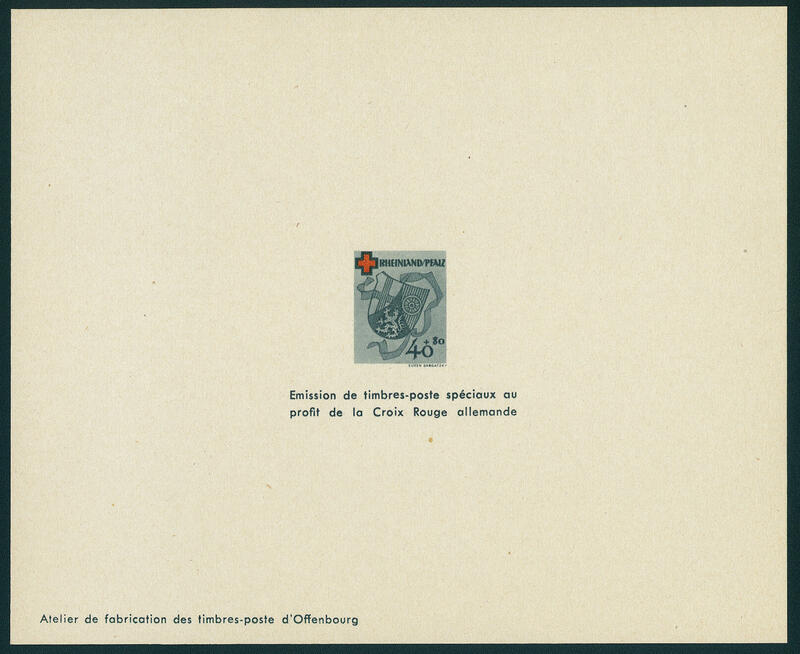 An especially attractive international franking! Photo expertize Straub BPP. 6636 ✉ 30/31 Auxiliary work Ludwigshafen with additional franking on registered cover with return receipt from \"KAISERSLAUTERN 4.1.49. 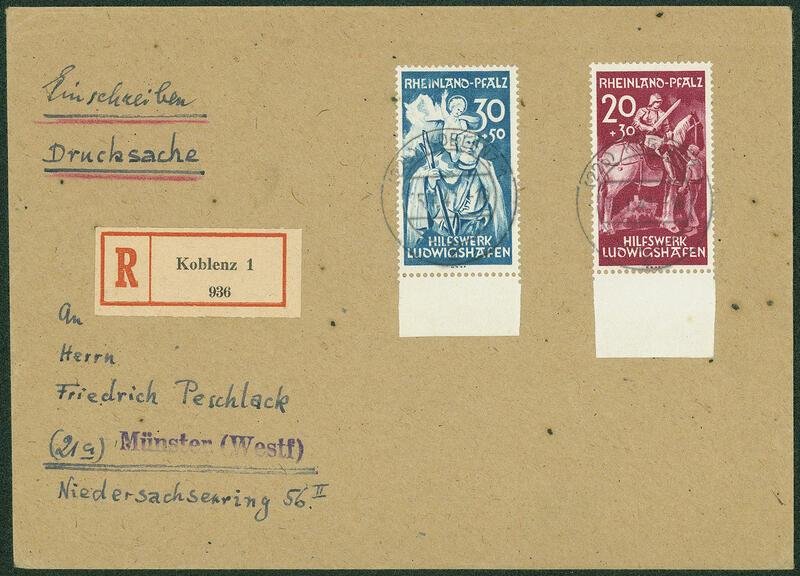 \" to Hagenow / Mecklenburg with arrival postmark. Very scarce utilization! Photo expertize Straub BPP. 6637 ✉ 30/31 Auxiliary work Ludwigshafen, 20 Pfg., as well 30 Pfg. 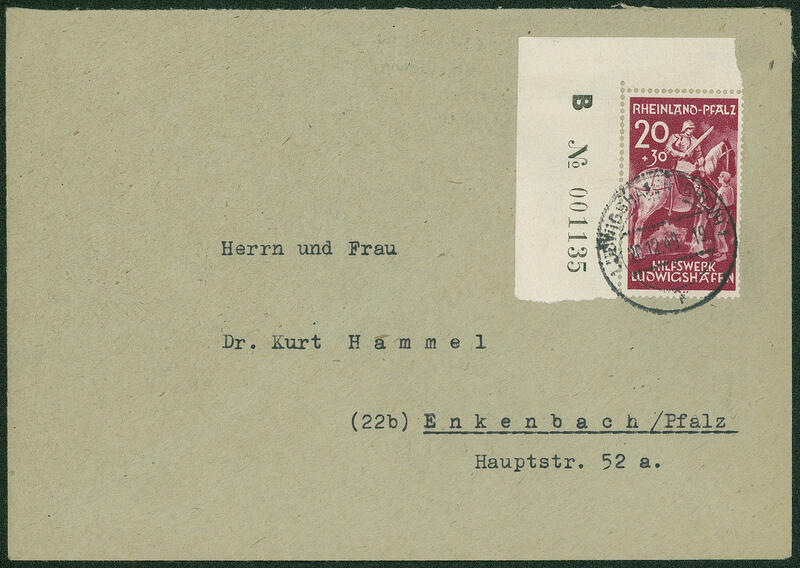 In the horizontal upper margin pair on correctly franked air mail letter from \"BROHL 11.11.48. \" to Chicago. Scarce franking! Photo expertize Straub BPP. 6638 ✉ 30/31 Auxiliary work Ludwigshafen with additional franking on correctly franked registered air mail letter from \"RÜBENACH 13.12.48. 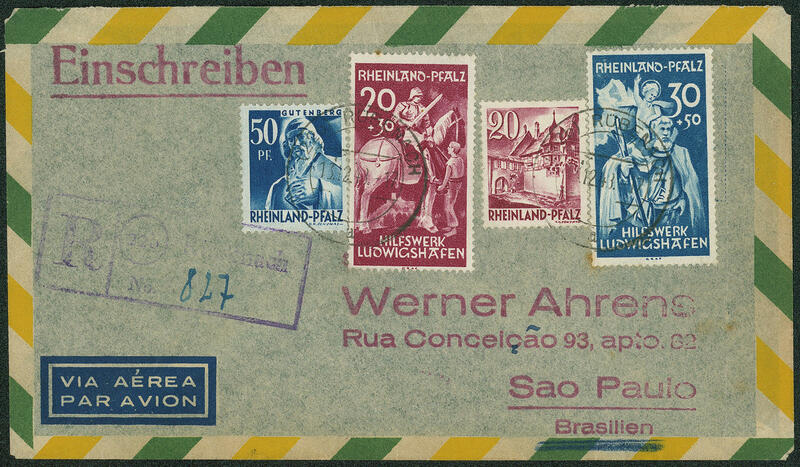 \" to Sao paulo / Brazil, minimal faults, a scarce destination! Photo expertize Straub BPP. 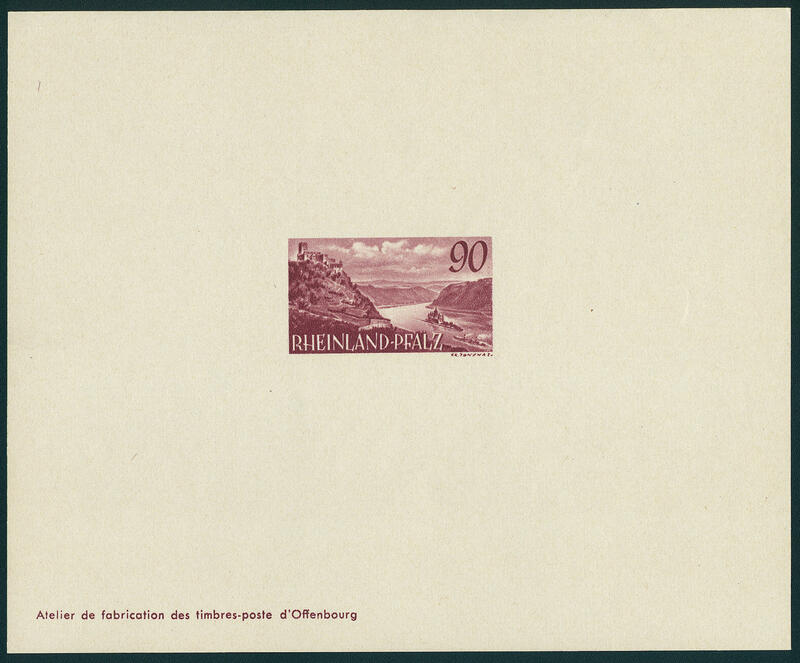 6639 ✉ 30/31 Auxiliary work Ludwigshafen, faultless set from lower margin on registered printed matter, unfortunately not correctly franked from \"Coblenz 5.1.48. 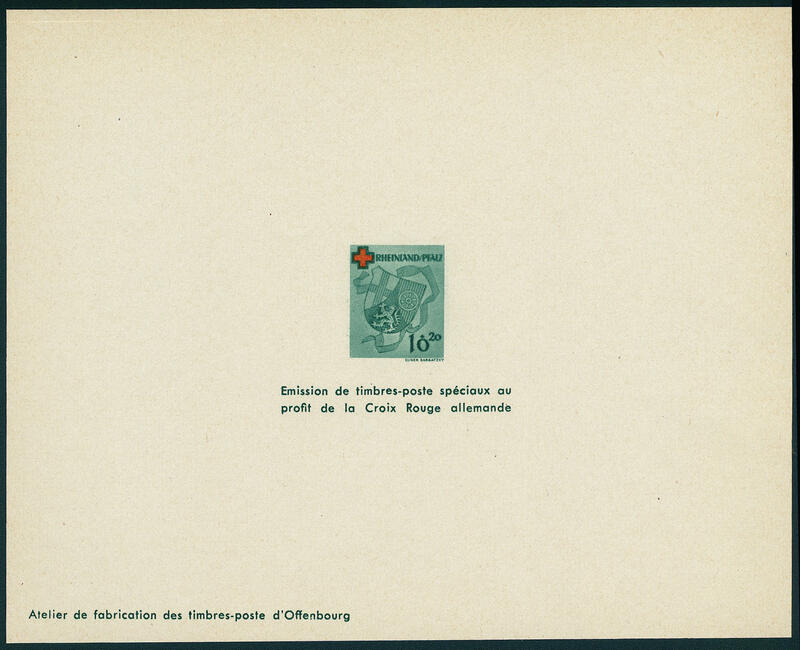 \" to cathedral with arrival postmark. Scarce utilization! Photo expertize Straub BPP. 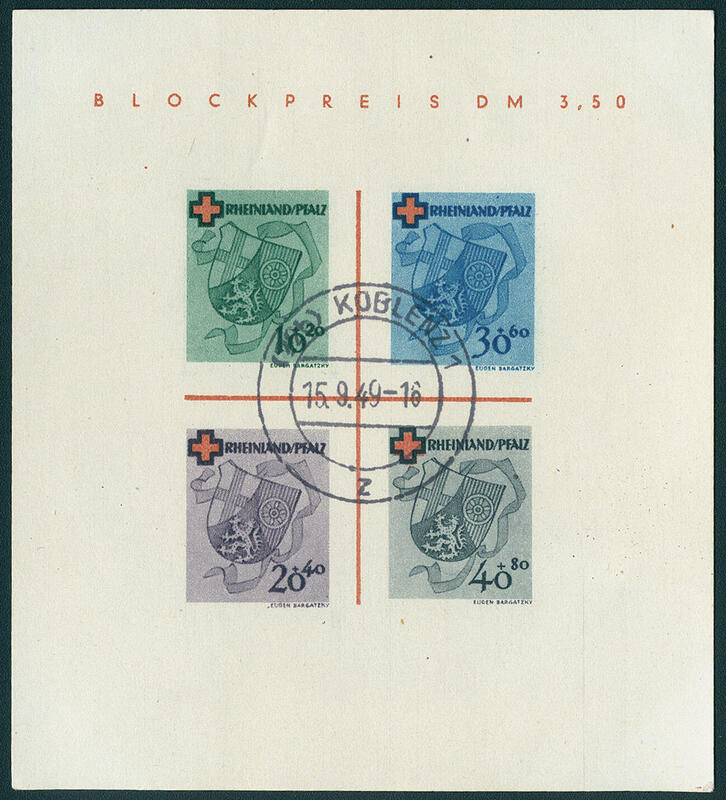 6640 FDC 30/31 Auxiliary work Ludwigshafen, faultless set with additional franking on registered First Day Cover from \"NEUSTADT 19.10.48. \" as local letter, in the 2. Weight step correctly franked franked, with arrival postmark from subsequent day. 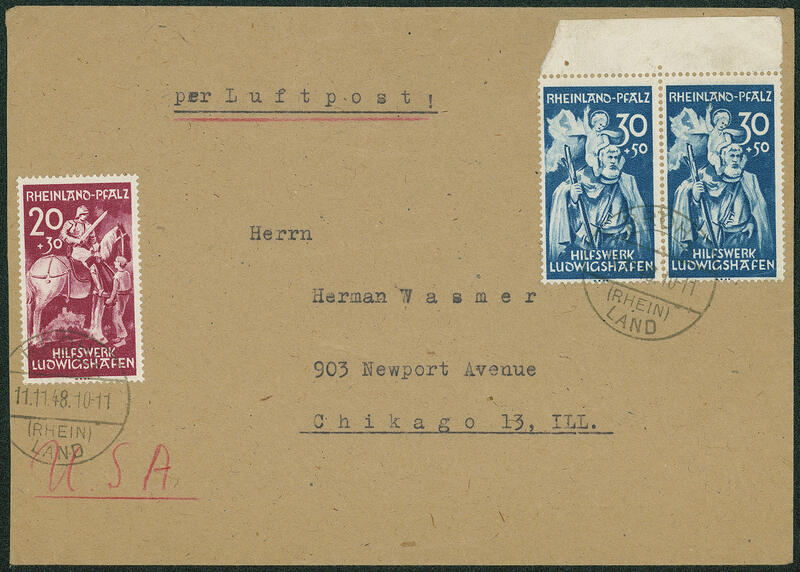 Used First-Day-Covers of this issue are very rare! Photo expertize Straub BPP. 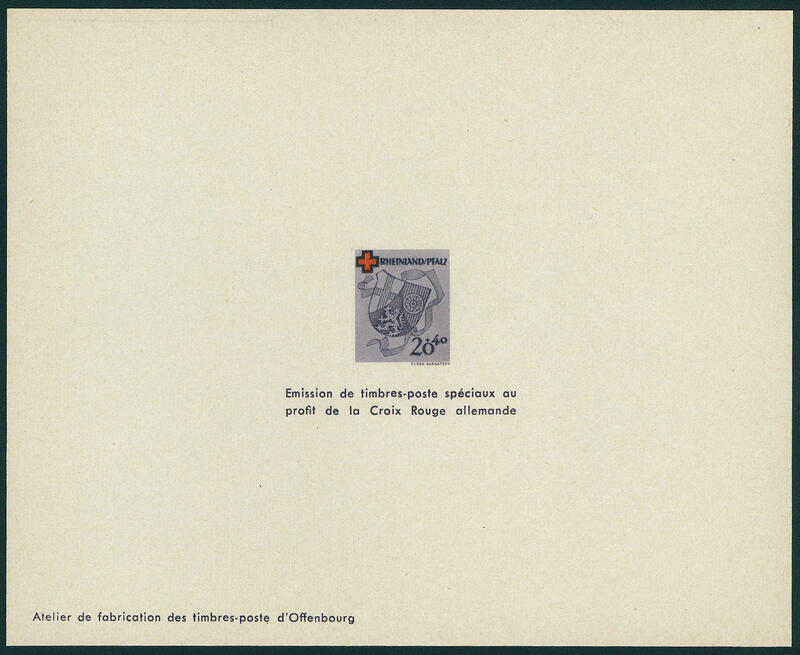 6641 30/31M Auxiliary work Ludwigshafen 1948, having bright colors Secretary of State souvenir sheet with both values, in perfect condition. Very small edition and by Michel undervalued! 6642 ✉ 31 30 Pfg. 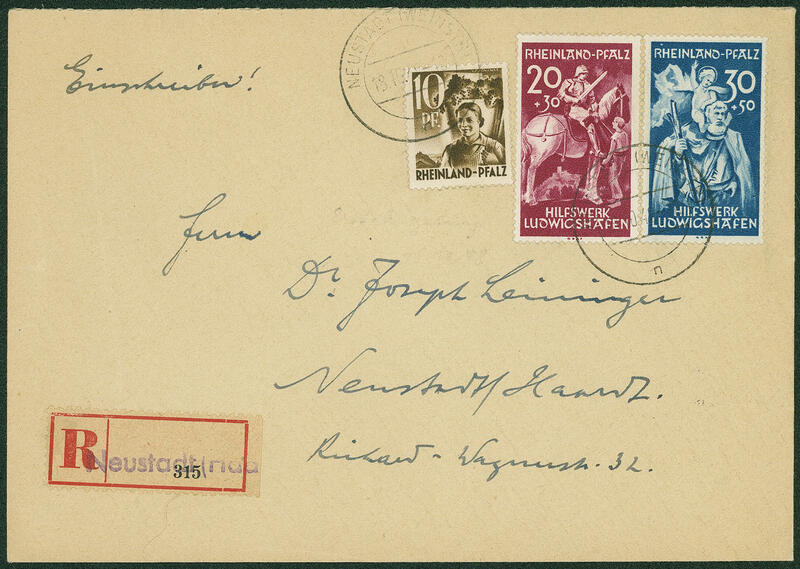 Auxiliary work Ludwigshafen, in perfect condition on very nice maximum card, neat cancelled \"LUDWIGSHAFEN 21.1.49. \". Maximum cards of this issue are extremely rare! Photo expertize Straub BPP. 6643 32/41M 3. Postage stamps set 1948, all 10 values as Secretary of State souvenir sheets, fresh colors and in original size in perfect condition. 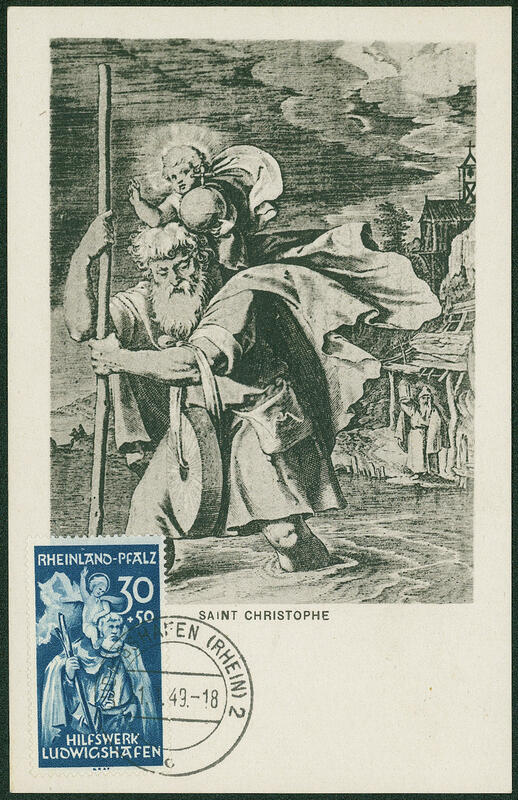 A scarce set with small edition, by Michel undervalued! 6644 ⊙ 36 8 Pfg. 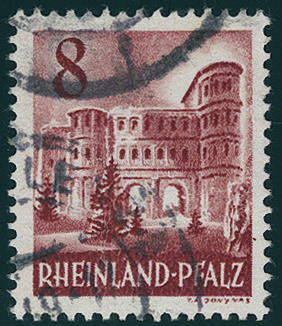 Porta Nigra, neat cancelled, expertized Schlegel BPP. Michel 500,- €. 6645 ⊙ 36 8 Pfg. Porta Nigra, neat cancelled, expertized Schlegel BPP. Michel 500,- €. 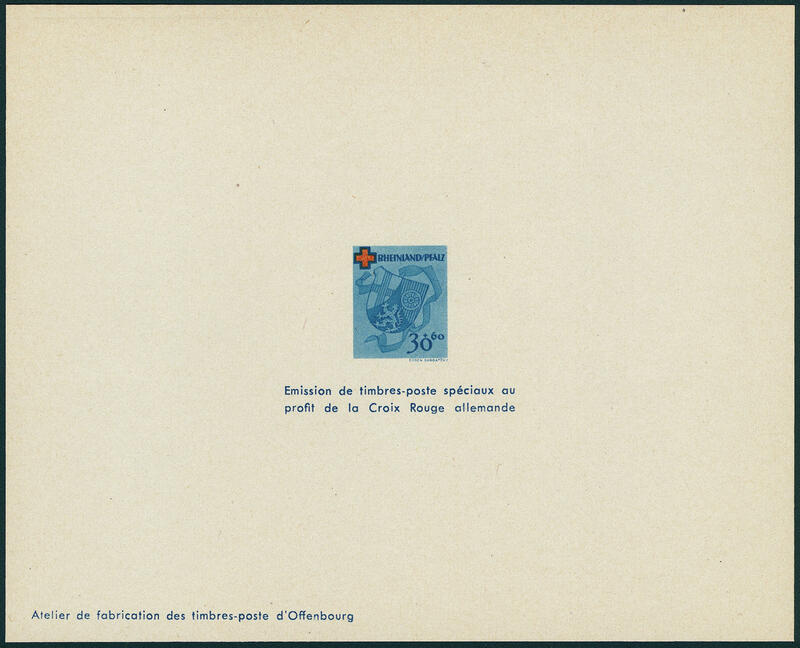 6646 ⊙ 42/45A Red cross set 1949, fresh colors and in perfect condition with special cancel \"STOLP\", expertized Schlegel BPP. Michel 440,- €. 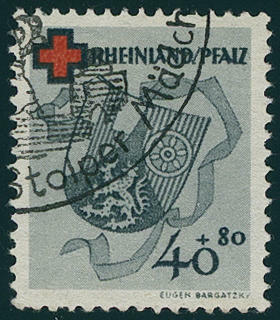 6647 ⊙ 42/45A Red cross set 1949, neat cancelled \"MAINZ 27.2.49. \", expertized Schlegel BPP. Michel 440,- €. 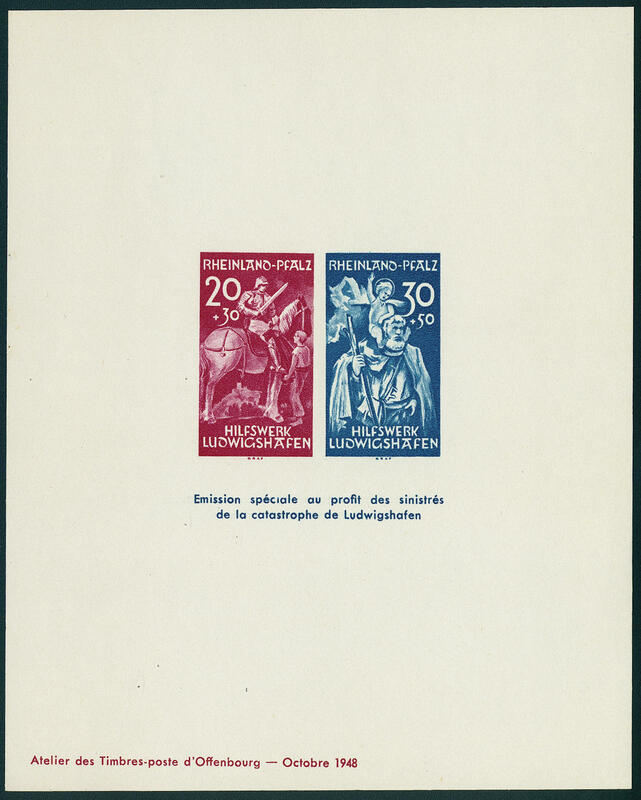 6648 ⊙ 42/45A Red cross set 1949, neat cancelled \"WINNWEILER\", expertized Schlegel BPP. Michel 440,- €. 6649 42/45M Red Cross 1949, all fours values as Secretary of State souvenir sheets, fresh colors and in original size in perfect condition. Very small edition and by Michel undervalued! 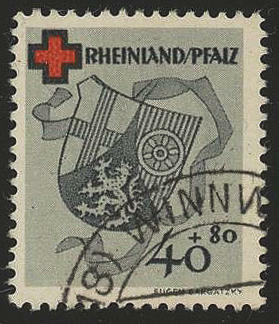 6650 ⊙ Bl.1I Red Cross 1949 fresh colors and in full original size, especially nice centric and neat cancelled \"Coblenz 15.9.49\" in utterly perfect condition. Photo expertize \"the quality is perfect\" Hans-Dieter Schlegel BPP.